Fawkes: I can see the listing, but the seller ships only within United States. Agreed, even getting sellers to ship to Canada is a challenge and the duty and brokerage that is charged sometimes makes it not even worth considering. On, i thought for sure that you've bought her, and the price was awesome, just $500.00. I was tempted but she looked so sad. I have no idea who she is or where to find other photo's of her work but her dolls are quite something, cute and with strong features. I've been watching that Russian artist too, Hasel! Those dolls are very tempting. I totally agree with you Caracal...living in the middle of nowhere too, importing is the only way to get dolls or stuff to make dolls. What bugs me even more than sellers who don't sell outside their territory - I can understand they don't want to take the risk - is sellers who don't even take the time to answer requests. Yes, they especially apear very affordable to me! If I hadn't just placed an order for a resin Lillycat doll (I just had to, those dolls are the best ever done in my mind, awwww those hips.... ), I would put a bid for this porcelain girl. The make up isn't 100% what I would like my doll have, but I could live with it. Somebody should just buy her, she is cute! And affordable. I like apple phone, at the time it was the one with a really good camera and takes excellent photos which means translates color and light very well. I think tech people enjoys androids more, however note 4 samsung is getting better. In maybe a couple years I might go with a samsung. but the only reason I remain loyal to apple because it's the only computer that hasn't died on me year after year. I had PCs for the longest time and basically I went with a computer that is more reliable. I had android phones before and it turns out I wasn't so into them until I actually had the iPhone. I think android phones are making a come back but it will take some time. however iPhone was the only one that had netflix and abc app, while the other android phones were not standardized to have the apps available to all android phones. So for me it's the app availability, durability and stability. however yes with dolls or any items available, it really has to do with rapport, reputation, marketing etc. I also think it has to do with location and the ease of pay. So it not only has to do with the quality of the product but how people actually know about it and if other people would like it. if people are looking to invest they want an item that they know will go high in value. the mass market is all about profiting and demand. 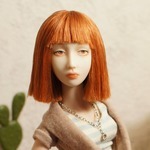 However the people who wants to enjoy just for the sake of enjoying will look into other dolls. I do like this doll but I have to LOVE a doll in order to purchase one. but it is tempting. what's making me a bit on the fence about this doll is the location and feedback. That doll is very beautiful! I would buy her too if I had the money. This artist has been selling on the russian version of etsy for a while. I think the sale is legit. I agree, the certainty of a secondhand market is a big reason why EDs are so fast to go. And Marina has had many years now to establish her brand, unlike these other artists! I think their time will come. I think it also has to do with presentation. Marina's photos are so clear and beautiful. I think this artist needs to take more pictures that are very clear. I like to be able to see the whole body somewhere online with detailed pics of the face, hands and feet. These are very lovely dolls and I think that would help them to be snapped up. Of course I myself cant take a clear picture to save my life - I am to impatient to do proper well thought out pics. There are some nice photos of her new project on her facebook page. Yes, it is so important to have good photos!!! And Marina/Chad are good with that. And yes, their location is easier for western people to buy a doll -especially if Russian artists don't use Paypal, which is the easiest way to pay. It is a good thing though, that many Russian artist are now entering western markets too . caracal, I am not on FB either - I refuse!